It has to be a ground issue, check and recheck. 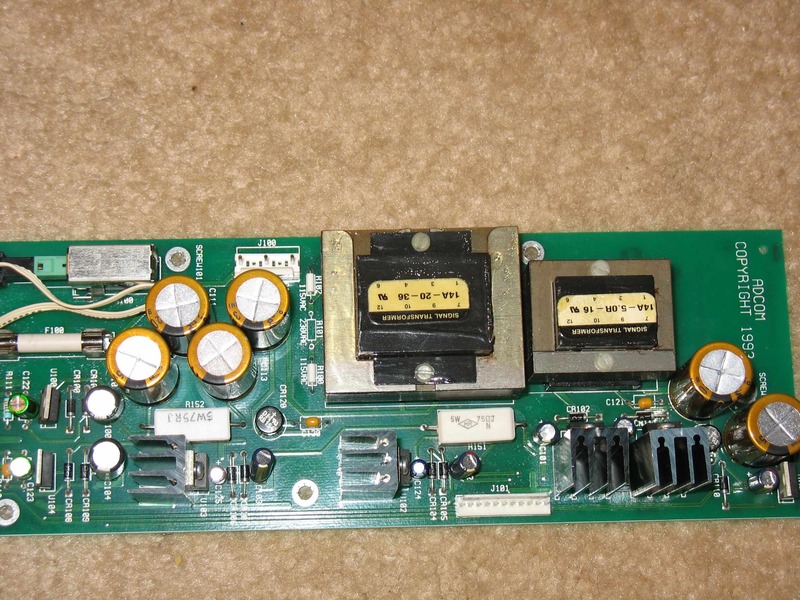 If all else fails maybe check for a cracked PCB.........it's a long shot but it is sort of fragile since it has to support both transformers. Also if you have a magnifier check you solder joints to make sure there isn't a slight "bridge" across the terminals, some of those smaller caps have almost no space between them. The gain after power supply capacitor changes was with the old OP amps in. With the old listening level at about 10 oclock on the volume knob I found i had to lower it to about 8:30. Its entirely possible that this wasn't a gain so much as the old supply caps were damping loud transients... definitely had a sense of greater dynamics but no hum. Hum is in both channels after step 2, very audible at about 11 oclock on the volume setting. Will check washers, these were between screw heads and PCB. For the power caps, I have these soldered to 4 & 8 on the backside of the PCB OP amp holder, 18awg wire soldered to cap ground leads , the wires twisted and attached to chassis ground screw. Will check capacitors for bridging. Really curious to see how this turns out as before I saw the thread I was contemplating buying a DLink III DAC... had a good experience with the Musical Concepts Hafler mod so wanted to give this a shot. 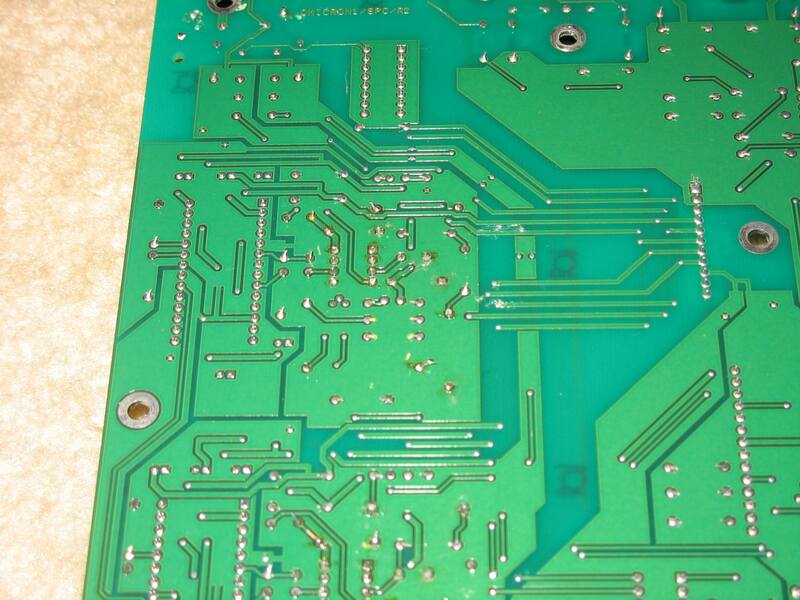 My soldering skill isn't the greatest but on the audio board the bad OP Amp forced me to look at every solder with NTF. Will recheck the power supply board and post any learnings. For the power caps, I have these soldered to 4 & 8 on the backside of the PCB OP amp holder, 18awg wire soldered to cap ground leads , the wires twisted and attached to chassis ground screw. I would solder the leads of these decoupling caps that should go to ground,directly to a ground trace/ground plane on the PC board instead of how you have it.Also be sure that the ones on the negative rail are installled with reversed polarity. Yes double check that the leads of all caps are soldered. still continuing to work this. 3) problem appears to create a feedback loop between preamp and DAC as moving preamp volume knob creates static transient that occurs with no other input source. 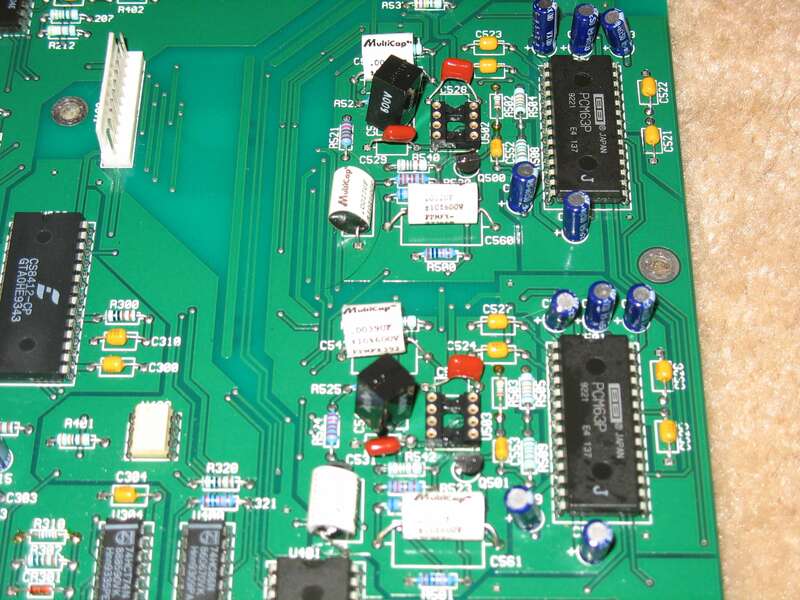 I have some Cardas solder on order, used Radio shack brand to start with, will desolder and solder all with new solder. 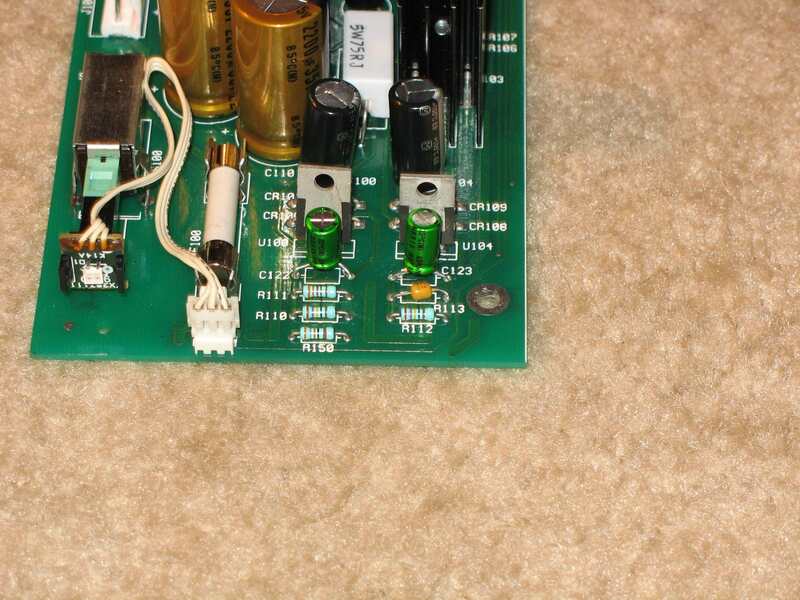 Also noted that on the power supply board near the off/on button one of the factory components marked on the board as a resistor instead has a capacitor. Will post picture later, curious if everone elses board has the same change. Excessive DC offset can do this,if you have a multimeter check for DC voltage at the outputs of each channel.You should have less than 10 milivolts.Also check pin 4 and 8 of both opamps to see if your getting the + and - 15 volts DC. Interesting,that sounds like a ground loop but the 600 has a pulse transformer on the coaxial digital inputs so a ground loop shouldn't occur.Optical is inherently immune to ground loops so this is a mystery. Will post picture later, curious if everone elses board has the same change. What is the actual part designation on the board?Hopefully Goerge will chime in on this one as I don't have a unit to examine. What can I do to help guys? Am I right in understanding that it's destroying the op-amps? What can I do to help guys? He was wondering about the resistor marked as a cap on the PS board. Am I right in understanding thats it's destroying the opamps? It might be George,thats why I suggest he check the voltage pins on the opamp socket to confirm they are correct.I would remove the opamps and not reinstall them until you are certain they are. A picture would help greatly--keep us posted. I see Parts Connexion has the Burson series 1 voltage reg's on sale.For those wanting to squeeze a bit more out their GDA600,IMO these discrete regulators feeding the OPA627's should take it to the next level.Burson 72017 and 72019 are the suitable replacements for U100 and U104 on the PS board. so the 72017 pops in U 100 and the 72019 pops in U 104? OK-- I think that i understand this-- I'm gonna order them and I'll report back here,,,one thing,,for Mr. Fred-- do I remove the reservour" cap that I added to the op amps? so the 72017 pops in U 100 and the 72019p pops in U 104? Not quite,you'll need to remove a few parts,and having a DMM so that you can do basic voltage checks would be recommended. ,one thing,,for Fred-- do I remove the reservour" cap that I added to the op amps? They can stay,but you will need to remove R110 and R112.Also remove R111,R113,C122,C123 and install a wire jumper in their place. Sure be glad to help if your going to give it try. Awaiting Phase II and the directions . George at first I was a little disappointed in this mod because it was really analytical and hyper detailed. But, I have to say after about 200 hours break-in this thing is phenomenal. Same detail but it's soooooooo smooth. Detail in spades, great extension and the decay and air around instruments is superb. Vocals are just unbelievable. I also find that the DAC needs about 30 minutes of warm up for it to sound good. Damn, damn, damn, you guys are killing me here. George, Fred, Ben or anyone feeling like doing this to mine for a couple bucks? R113 should be a 3k32 resistor.How did that cap get in there? Maximum supply voltage for the OPA627 is rated at + -18 volts so thats why they are failing.That cap in the regulator circuit is likely part of the issue for the negative voltage but doesn't explain why the positive reg (LM317) is putting out 21 volts also. 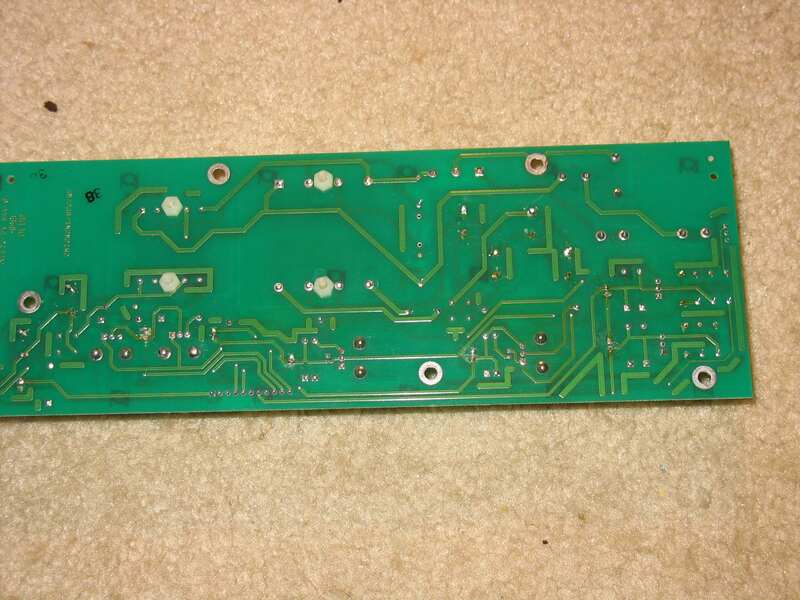 If you look at the pics I posted as Fred states there should be a resistor at R113. Wow! I would gladly do it for you Dave but looks like George has you covered.Also shipping might be a pain. You are plenty capable sir,and I would be concerned that shipping up here would be expensive and a hassle with customs etc. Im happy to be helped, haha. Whichever of you fine gentlemen, I would be grateful. Due to logistics, George you would probably be best option, Pm inc. Thank you Fred for the offer, as always, you rock. Edit; stay close to the original plan,is what the above statement means.